Creating automotive radar applications for mmWave needs special tools. By implementing radar technology over the 76 to 81 GHz spectrum, advanced driver-assist systems (ADAS) enable smart vehicles with the ability to alert and assist drivers in a variety of functions, from low tire-pressure warning to collision avoidance to self-parking. These automotive radar applications use the millimeter-wave (mmWave) spectrum to exploit more bandwidth for greater resolution and object detection. However, higher frequency propagation comes with greater path loss, as isotropic free-space attenuation is inversely proportional to wavelength. In addition, along with this additional path loss, as wavelengths get smaller, physical processes such as diffraction, scattering and material penetration loss make the channel properties of mmWave bands significantly more challenging. This blog discusses several challenges behind developing mmWave radar systems for the next generation of smart cars and trucks and looks at new capabilities recently added to electronic design automation (EDA) software that support a design flow for developing high-performance arrays that are also cost and space conscious. The radio-frequency (RF) front-end hardware supporting these new antenna systems must be optimized for performance, reliability, compactness, and cost. The individual components must be specified and developed through a design flow that manages and combines this performance data in order to achieve accurate simulation of the overall array and feed structure across scan region, frequency range, and other operational requirements. This flow should also provide a pathway to physical realization of the individual components, including the antenna array itself. We show an enhanced phased-array generator wizard that enables users to interactively develop phased-array antenna systems and generate array and feed network schematics or system diagrams suitable for further circuit/system/EM analysis. Users can define the array geometry (configuration), feed structures, gain tapers, and characteristics of individual elements and their respective RF links. Automobile manufacturers are equipping new models with ADAS based on vision sensor technology and radar systems operating at 24 and/or 77 GHz. Figure 1 shows the different ADAS functions and ranges. Figure 1. 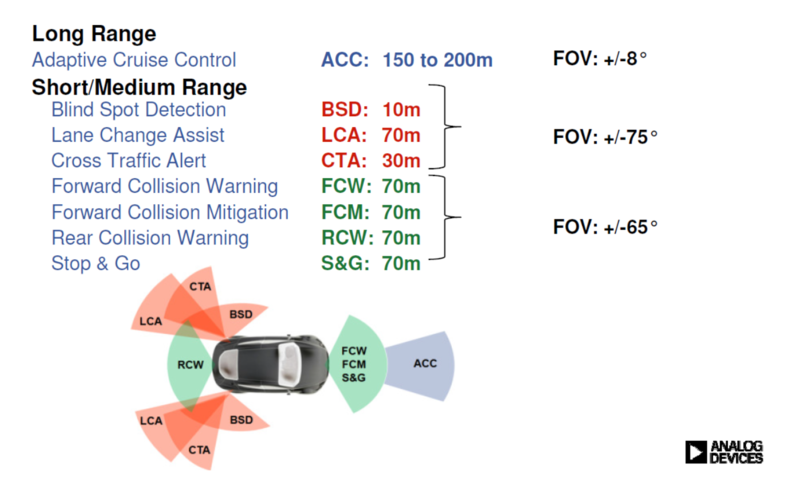 Different ranges, fields-of-view (FOV,) and function for ADAS. Image courtesy of Analog Devices. The technical advantages of the 77-GHz band include smaller antennas (a third of the size of the current 24-GHz ones), higher permitted transmit power, and, most importantly, wider available bandwidth to enable higher object resolution. The design of waveforms, baseband signal processing, and parameter estimation for radar systems with specific analyses for radar measurements, along with comprehensive behavioral models for RF components and signal processing. The component and array/antenna requirements are determined using system-level link analysis. The design of transceiver RF/microwave front-ends with circuit-level analyses and modeling (distributed transmission lines and active and passive devices) to address printed circuit board (PCB) and monolithic microwave integrated circuit (MMIC)/RFIC design. Planar/3D electromagnetic (EM) analysis for characterizing the electrical behavior of passive structures, complex interconnects, and housings, as well as antennas and antenna arrays. 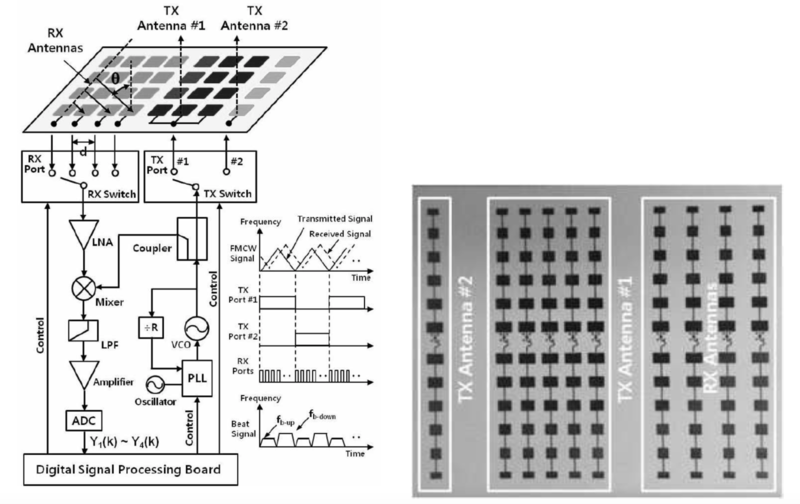 Antenna synthesis generates a physical antenna design based on performance specifications. Supports array configuration, early analysis of array using radiation pattern for individual array elements, and feed network based on user input, generating circuit/system schematics and test benches for further analysis. One goal of the phased-array generator wizard is to provide designers with a powerful yet intuitive interface to define a physical-array configuration, assign antenna and RF link characteristics to individual and/or groups of elements, define feed networks and gain taper properties, and simulate the response, inclusive of potential element failure (Figure 2). This enables users to produce a far-field plot that can be swept for frequency, input power, and phi and theta angles using slide tuners to control these parameter values. The resulting antenna pattern view provides designers with a real-time visual aid depicting the impact of design decisions on far-field performance. Figure 2. The auto group option enables users to specify basic array configuration and review the physical composition of the antenna array (left image). The graphical view (right image) allows users to observe the array radiation pattern in real-time while adjusting the frequency, power level, and steering angles (theta/phi). Developing actual phased-array hardware requires the design and simulation focus to shift toward circuit-level analysis and physically-realizable components. The entire available design flow, from antenna synthesis, generation of antenna radiation patterns through EM analysis, configuration of the array and feed network, and generation of circuit or system-based schematic design is shown in Figure 3. Figure 3. 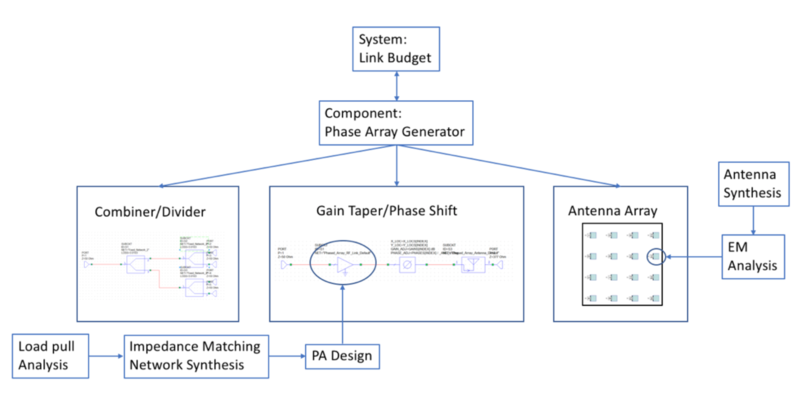 The VSS phased-array generator wizard uses designer input to generate the antenna array, amplitude/phase shift elements, and combiner/divider system-level network. A multi-modal radar for an ACC system based on a frequency-modulated CW (FMCW) radar driving multiple antenna arrays is shown in Figure 4. This example illustrates the use of multiple antenna-array systems that were required for this type of system., including multiple (5 x 12 elements) series fed patch antennas (SFPAs) for the long range, narrow angle detection (77 GHz), a single SFPA (1 x 12 elements designed for 24 GHz) for short, wide angle detection, and four (1 x 12) SFPAs for the receiver. Figure 4. Multi-band, multi-range FMCW digital beam-forming ACC radar utilizing six individual SFPAs. Radar performance is greatly influenced by the antenna technology, which must consider electrical performance such as gain, beam width, range, and physical size for the particular application. The multiple, fixed TR/RX antenna arrays in this radar were optimized for range, angle, and side-lobe suppression. A patch antenna is relatively easy to design and manufacture and will perform quite well when configured into an array, which results in an increase of overall gain and directivity. 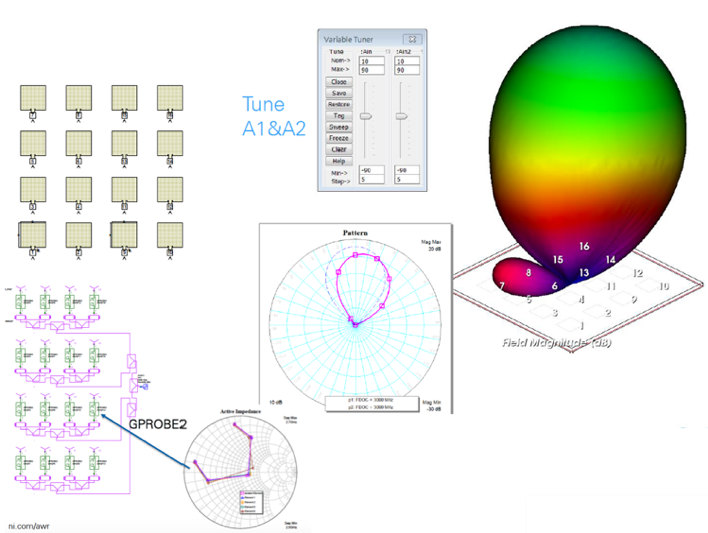 With individual elements designed and characterized through EM analysis, users can specify array parameters (size, number of elements, element spacing, shape, and more), organize radiating elements into groups and assign different antenna radiation details and RF link properties to individual or multiple elements at a time, usually based on location within the array, such as an edge or corner. This capability helps simplify and expedite the process of setting up arrays with many elements by scaling element/feed details to the entire array using a smaller, more manageable number of element groups. Elements within the same group may then be assigned an antenna and/or RF link configuration from among multiple user-defined configurations. The NI AWR Design Environment platform also provides capabilities for additional design detail and in-depth analysis for further hardware development, including full EM simulation of the entire array, along with co-simulation of the feed structure represented by circuit- and system-level behavioral blocks constructed from information defined by the user in the phased-array generator wizard. The phased-array generator wizard supports the generation of simulation-ready circuit, system, and data file-based designs configured into hierarchical schematics for analysis by Microwave Office or VSS software and the assigned EM simulator. With the wizard generated array geometry, AXIEM and Analyst simulators or supported third-party EM tools such as HFSS can be used to analyze the entire detailed physical array, with the individual port feeds pre-defined. This enables the design team to investigate the interaction between the beam angle and the input impedance of each individual element, as well as to account for impedance loading effects on transceiver performance (Figure 5). This capability highlights the importance of co-simulation between RF circuit, system, and EM to accurately investigate circuit/antenna behavior before fabricating these complex systems. Figure 5. 4×4 patch antenna array with individual ports for each element. The software allows designers to define and co-simulate the feed structure (lower left) at the circuit/system level to monitor the changing antenna input impedance per element and control beam steering through the RF feed network. Advanced driver assistance systems will not only become more sophisticated and reliable as technology develops, they will become more prevalent on most if not all vehicles in the not-too-distant future. Thanks to similar advances in antenna array and mmWave technology that are occurring in 5G communications, most cars and trucks will be considerably safer than today. Innovations in simulation technology and a new design flow in NI AWR software support RF-aware circuit design, array configuration, modeling/optimization, and system-level co-simulation, enabling antenna designers and system integrators to optimize these systems for challenging size, cost, and reliability targets. H. Jeong, H., Y. Yu, J., E. Lee, et. al., “A Multi-beam and Multi-range Radar with FMCW and Digital Beam-forming for Automotive Applications,” Progress in Electromagnetics Research, Vol. 124, 285-299, 2012.